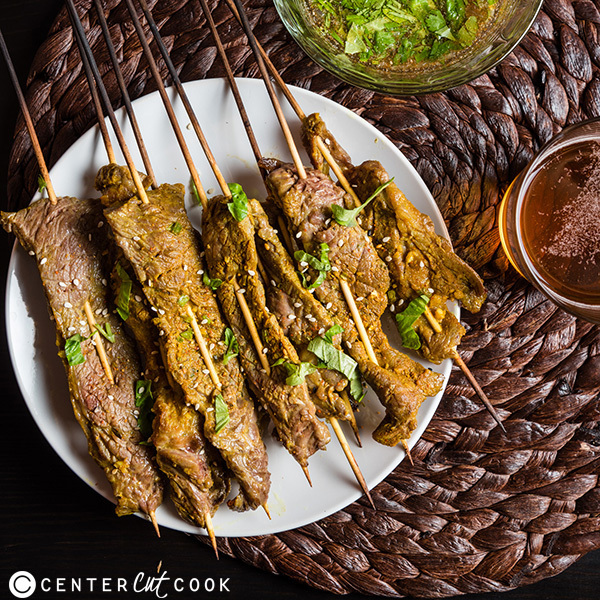 Thai beef skewers are a wonderful party snack and are very easy to prepare ahead of time. The beef is marinated in various spices to create a refreshing savory flavor. It is grilled until perfectly charred, and served with a sweet and sour Thai dipping sauce. Have you ever wondered how Thai restaurants create such flavorful and perfectly cooked beef skewers? It’s much easier than you thought! The truth is, you probably already have most of the ingredients in your kitchen. If you don’t usually cook Asian food, the only special spices required in this recipe are turmeric powder and fish sauce. You can get these two ingredients at a fancier supermarkets such as Whole Foods or at an Asian market. Don’t forget to store the fish sauce in the fridge after opening. It might seem like a giant bottle, but it lasts forever if you store it properly. It’s a must-have ingredient for cooking authentic Asian food, such as Thai, Vietnamese, Indonesian, and Chinese. 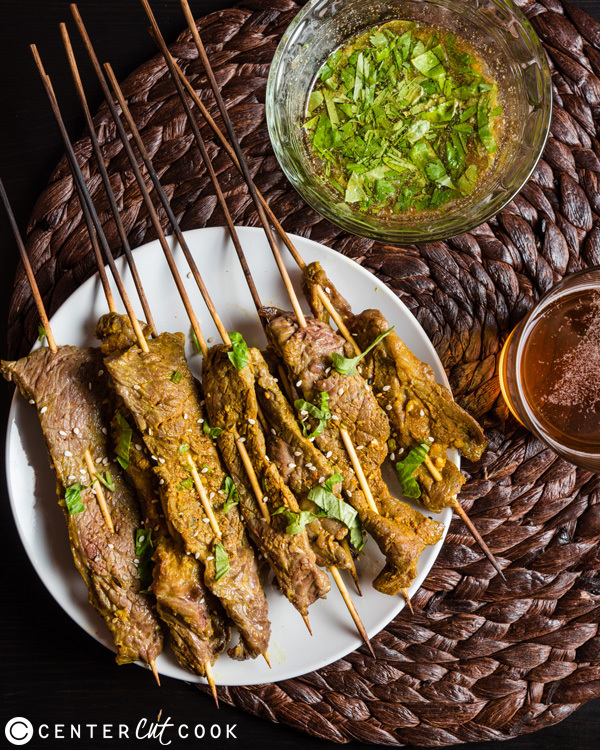 To make authentic tasting Thai beef skewers is easy. You only need to mix a few spices together and marinate the meat for at least an hour, up to overnight. To cut the meat like a real Thai restaurant, you need to slice the beef against the grain into 1/4-inch thick strips. The beef will marinate and cook through faster this way. However, if you prefer the normal kebab-style cut, i.e. bite-sized chunks, you can do that without any problem. Make sure you leave enough time to marinate the meat (2 hours or more), and cook the beef a bit longer. You can serve the skewers warm or cold, but I love the just-off-the-grill ones the best! Lightly season the skewers with a bit of dipping sauce, open a cold beer, and turn on some music. You’re ready to party! Slice beef against the grain into thin strips, about 1/4 inch thick. Combine fish sauce, onion, garlic, turmeric powder, ginger, and sugar in a small bowl. Mix well. Transfer beef to a Ziplock back and add marinade. Massage the bag a few times to mix the marinade evenly with the beef. Seal the bag and let marinate for at least 1 hour, up to overnight, in the fridge. Combine all the ingredients for the dipping sauce in a small bowl. Mix well. Let sit for an hour. Skewer the beef lengthwise like you are using the wooden skewer to stitch a thread through the beef. Spread the beef slices flat so they are not overlapping. Depending on the size of the slices, use 1 to 2 slices on each skewer. (Option 1) To grill the skewers: Spray a thin layer of oil onto the grill and heat. Cook beef skewers until both sides are nicely charred. Use high heat if you prefer the beef still a bit pink inside. Use medium heat if you want your beef well done. (Option 2) To bake the skewers: Preheat oven to 450 degrees F. Spray a thin layer of oil on the baking rack. Cook the skewers on the middle rack, 3 to 4 minutes on each side, until they reach the doneness you prefer.